Water, rapeseed oil, sugar, concentrated tomato puree (5%), ginger puree (5%), garlic puree (5%), salt, ginger powder (4.5%), coriander powder, dried fried onion (onion, rapeseed oil), maize flour, cumin powder, paprika powder, smoked paprika powder, acid (acetic acid), spices, paprika extract, cardamom powder, dried fenugreek leaf. May contain mustard. Made in a factory that uses nuts and peanuts. 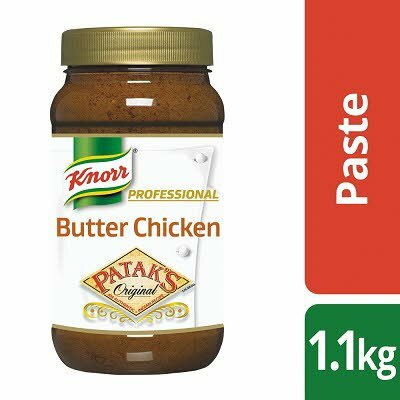 Use straight from the jar as desired or according to the recipe suggestion. It is important that this product is not consumed uncooked. Store in a cool, dry place away from direct sunlight. Once opened use within 6 months or before Best Before End date.